If you happen to stop by the High Roller on the Las Vegas strip next week in between InfoComm activities, your experience on the world's tallest observation wheel will feature AV technology courtesy of Alcorn McBride. When visitors arrive at the wheel’s pre-ride building they meet Lucas, the narrator of the High Roller experience. Two Alcorn McBride AV Binloop HD units feed monitors throughout the facility. 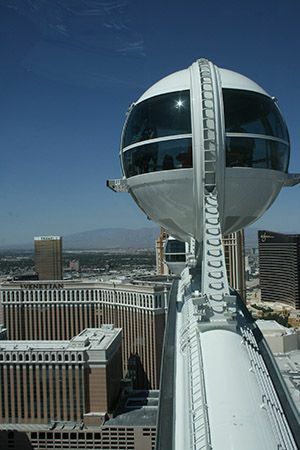 The High Roller, which serves as the focal point of The LINQ, the innovative shopping, dining and entertainment district developed by Caesars Entertainment, is a 550-foot tall wheel with 28 glass-enclosed cabins that hold up to 40 passengers each. The 30-minute ride includes a dynamic video and music show that fades away as the wheel ascends along with a colorful nighttime light show. When visitors arrive at the wheel’s pre-ride building they meet Lucas, the narrator of the High Roller experience. Two Alcorn McBride AV Binloop HD units feed monitors throughout the facility. In the security area, visitors see five consecutive portrait-mode monitors where Lucas’s image is locked together and interacts with five different feeds of himself. In the reception and bar areas sets of monitors feature graphics and pricing for the ride. The departure concourse houses a 270º curved screen measuring 121 x 13 feet. Six video projectors display a giant, edge-blended image across the screen offering a glimpse of the adventure to come. Moving lights enhance the space and a 12-channel plus subwoofer sound system delivers the audio. All of the imagery and audio are run from Alcorn McBride V16 Pro and LightCue Pro systems. Each cabin on the High Roller has a dedicated V16 Pro and AV Binloop HD, which feed eight monitors wrapped above the windows of the cabin. They display content relevant to the position of the wheel at that moment, such as what sights visitors are seeing and how high in the air the wheel is. Dedicated AM4 units in each cabin play background music and announcements. All 28 cabins talk back to another V16 Pro on the platform that sends information to each cabin when the wheel is rotating. When visitors finish riding the High Roller they can stroll along the quarter-mile LINQ, which features a sound system along its entire length. A V16 Pro runs the time-of-day routines, sets levels and adjusts music types. Announcements are run through an AM4, controlled by the V16 Pro.